Stir together milk, sugar, and baking soda in a pot. Bring to a boil and reduce heat to a simmer. Leave uncovered, stirring fairly regularly until caramelized (and thickened) – 2 hours. Stir in vanilla extract. Transfer to a glass jar and allow to cool. Mix lime juice, honey, and ground paprika in a small bowl. Set aside. In a pan over heat, melt butter and brown pineapple slices (both sides, please!). 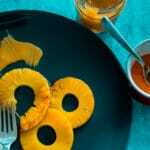 Spoon the lime-honey sauce on to the grilled pineapple slices, and continue to cook for 5 minutes (both sides, again!). Makes 1 ½ cups of dulce de leche.